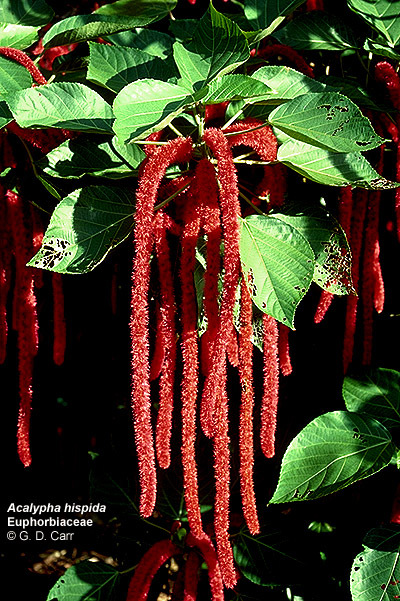 Acalypha hispida, chenille plant. Shrub, probably from the E. Indies, with long pendulous catkins of female flowers with feathery stigmas. Male flowers seldom appear on this species in Hawaii. 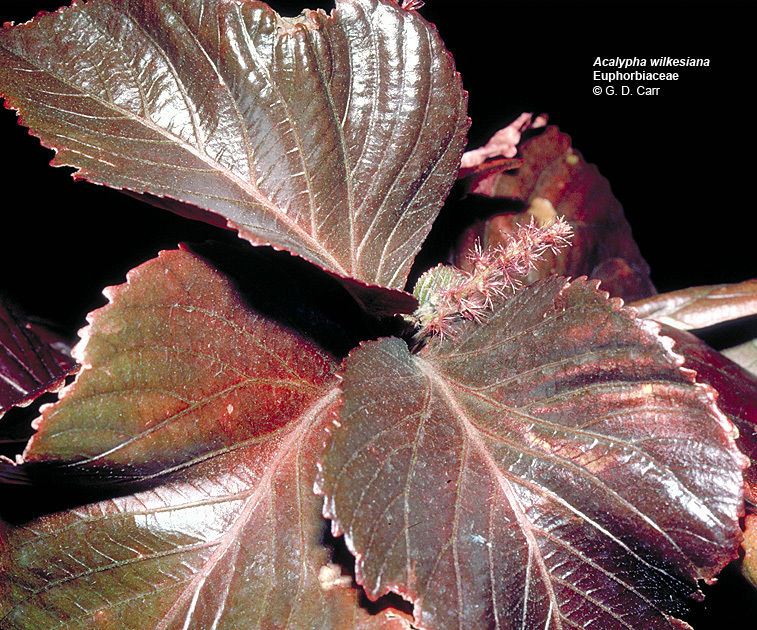 Acalypha wilkesiana, copper leaf, Jacobs coat, beefsteak plant. Shrub from Fiji with red-mottled, bronzy-green. leaves and tiny flowers. Many cultivars are grown for the ornamental value of the foliage. 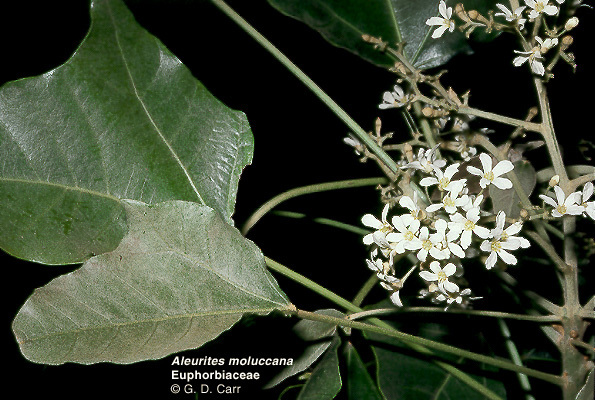 Aleurites moluccana, kukui, candle nut tree. 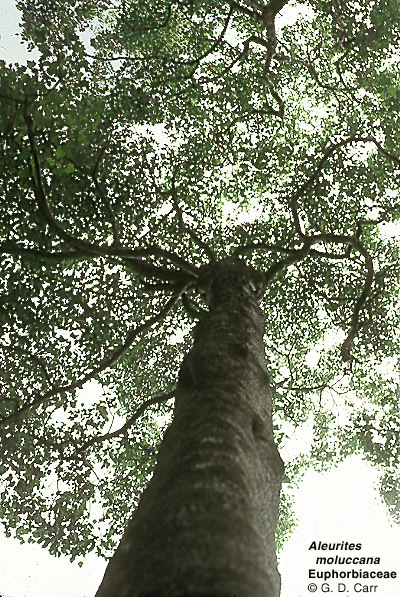 A polynesian tree probably brought to Hawaii by early polynesian settlers. 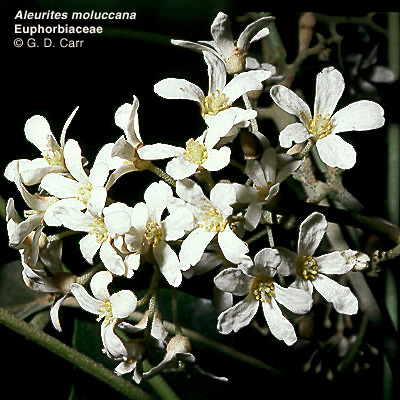 Official tree of the State of Hawaii and island flower of Molokai. 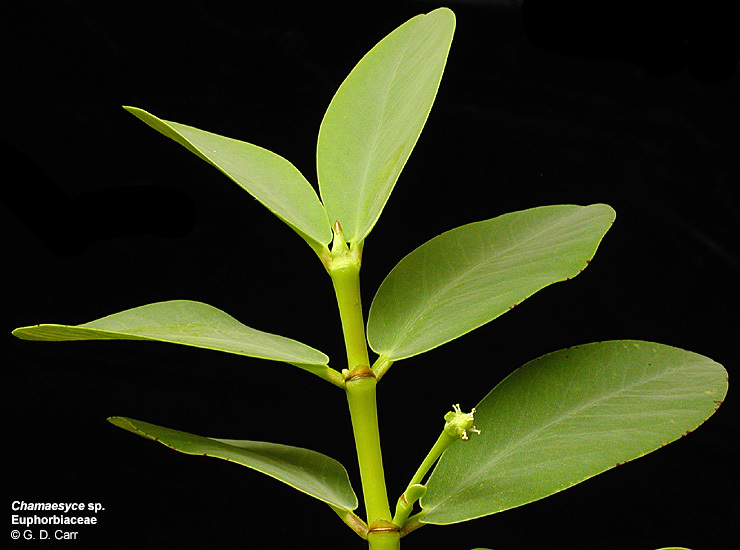 One of the most important plants of the old Hawaiians, the kukui was used for light, canoes, fishing, tanning, leis, catching birds, and as a source of food, medicine and dye. 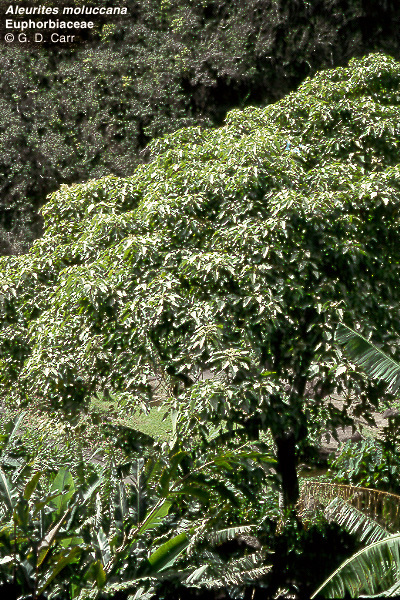 The pale green foliage of kukui trees, which commonly grow at the head of hanging valleys, stands out from great distances. 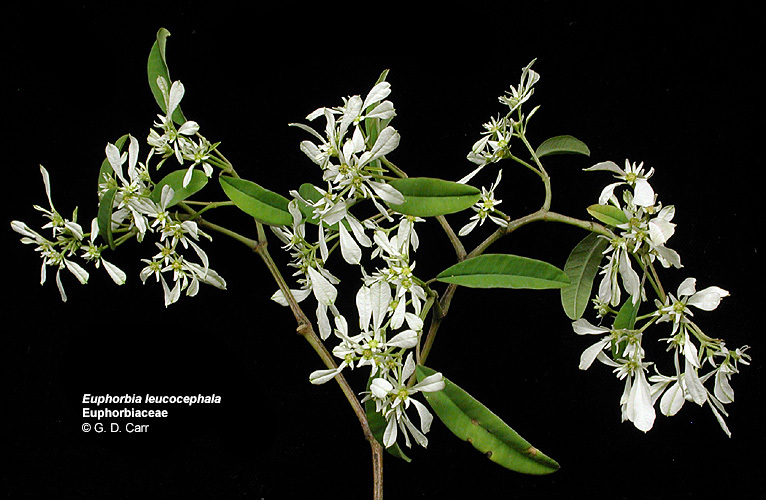 Chamaesyce celastroides, akoko. 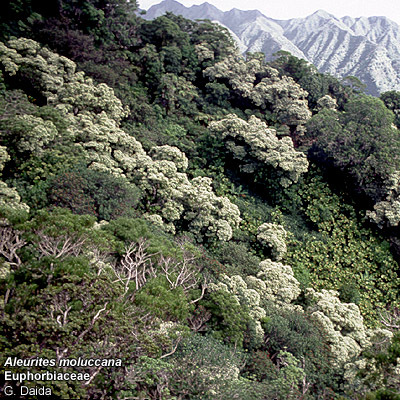 Note the cyatheum structure and milky sap at the extreme right in this endemic Hawaiian species. 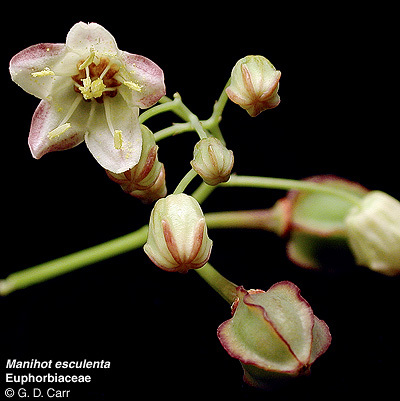 Chamaesyce degeneri, endemic to Hawaii. Chamaesyce hypericifolia, graceful spurge. Note the cyatheum structure, stipules, and milky sap. Chamaesyce sp., endemic to Hawaii. 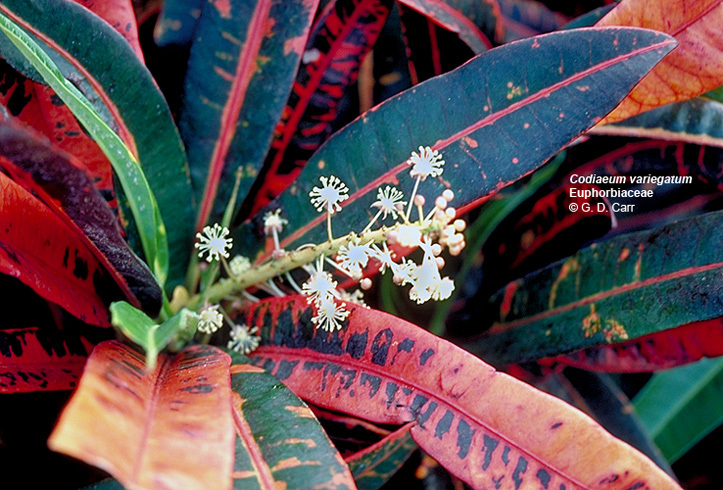 Codiaeum variegatum, croton. Ornamental shrub from the south Pacific, grown for the attractive foliage which is available in many brilliant colors. 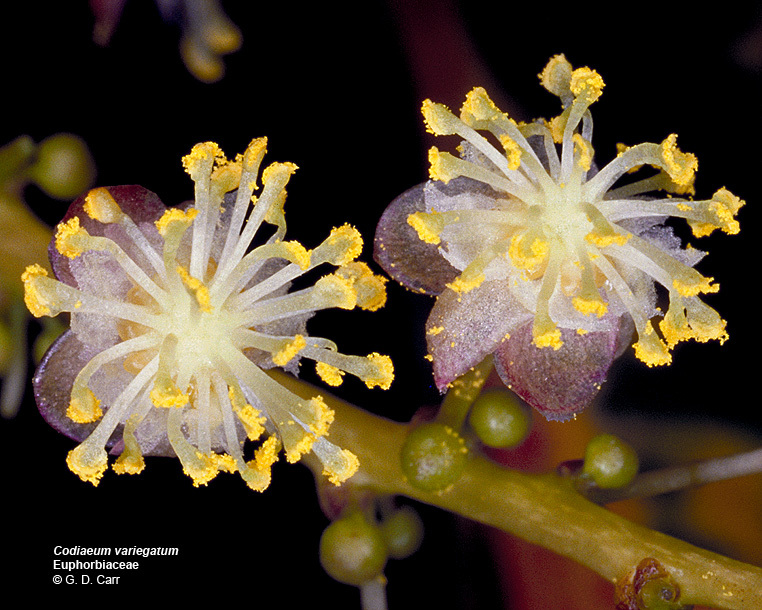 Close-ups of male (2) and female (3) flowers are shown. 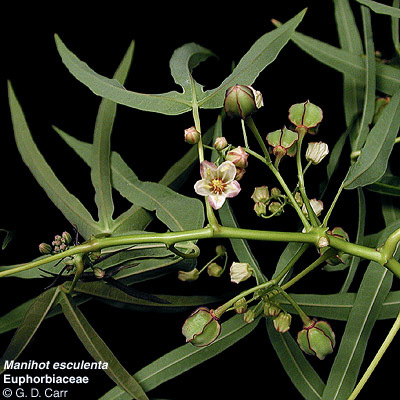 Euphorbia classenii. 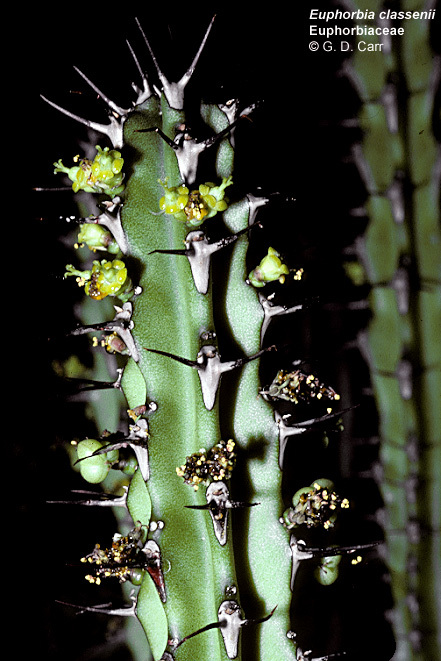 Many species of Euphorbia in desert areas of the Old World have a vegetative appearance (reduced leaves and succulent photosynthetic stems) much like Cactaceae in New World deserts but the floral features are extremely different in these unrelated families. This is a classic example of convergence, in this case involving modifications that enhance survival in very dry environments. 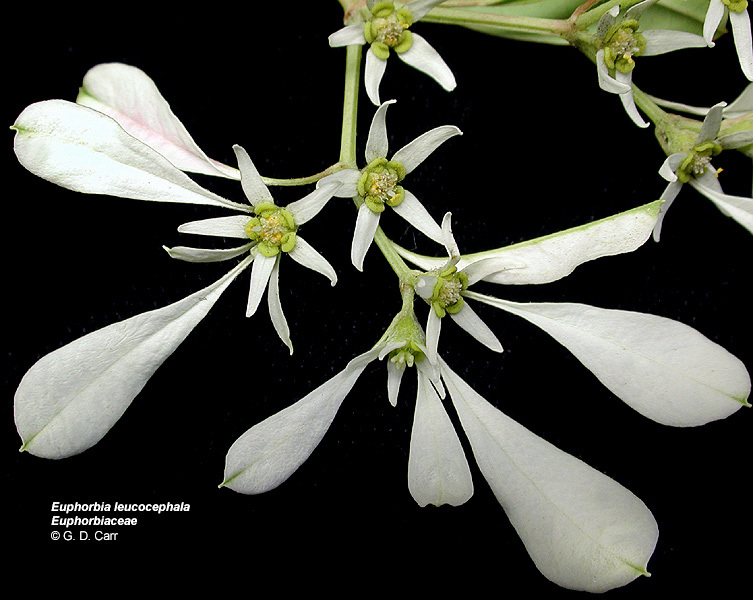 Euphorbia leucocephala, white-lace euphorbia, pascuita. 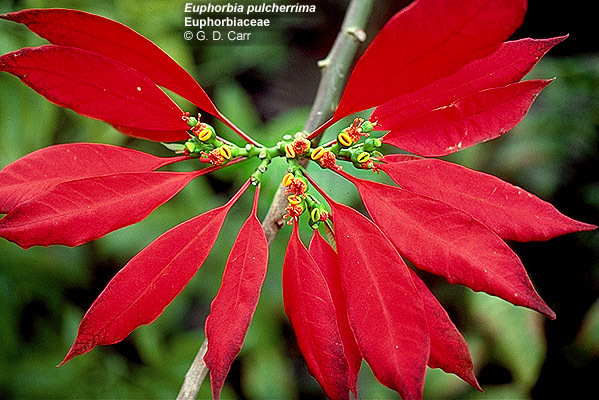 Euphorbia pulcherrima, poinsettia. 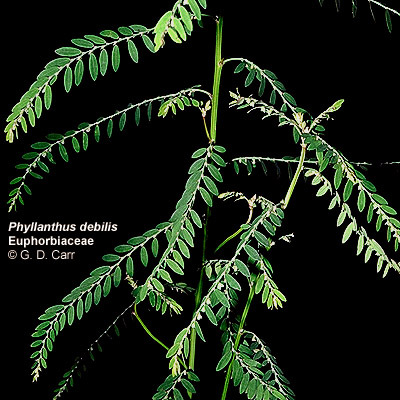 This ornamental species has very conspicuous red bracts associated with the cyathea. Notice also a large yellow gland on the involucral cup of each cyatheum. 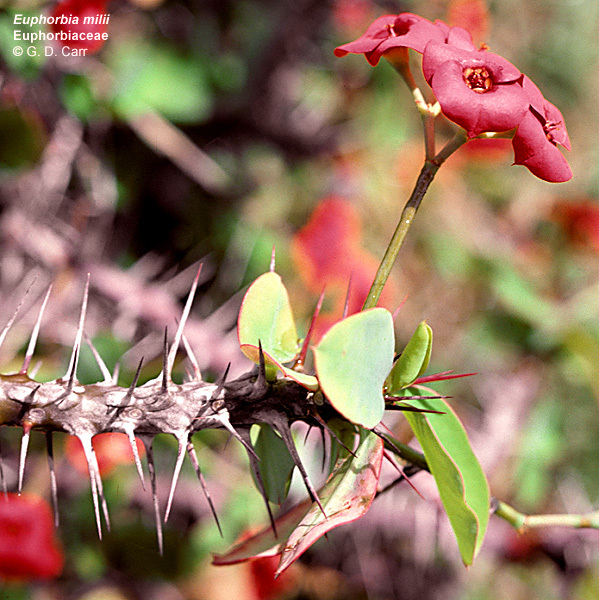 Euphorbia splendens, crown of thorns. Ornamental shrub from Madagascar. Legend suggests that the bracts were white until the plant was worn by Christ as the "crown of thorns," whereupon they became red. 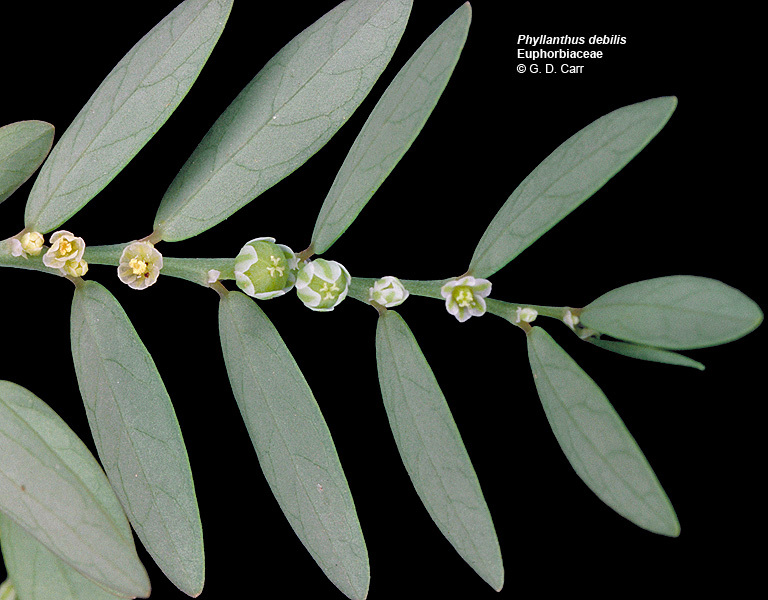 Euphorbia sp. 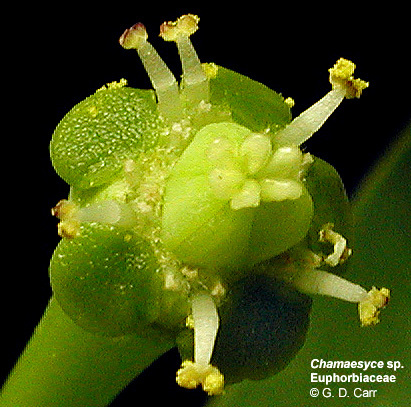 This is an example of a specialized, miniature inflorescence that mimics a single flower. The general term for this condition is a pseudanthium but in this family the pseudanthium is so specialized it is called a cyathium. It consists of a single central naked female flower surrounded by cymes of naked male flowers each consisting of a single stamen. 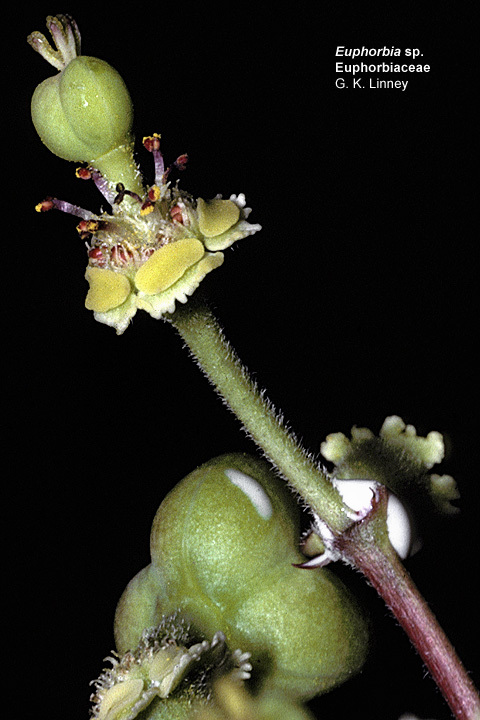 These naked flowers are surrounded by a cup-like involucre that bears glands and petal-like appendages, although in this species they are not particularly showy. Note the three styles and milky latex also visible in the photo. 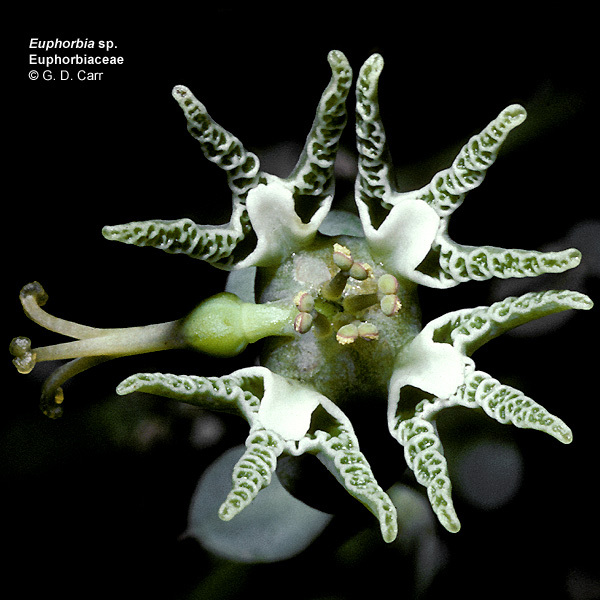 Euphorbia sp. 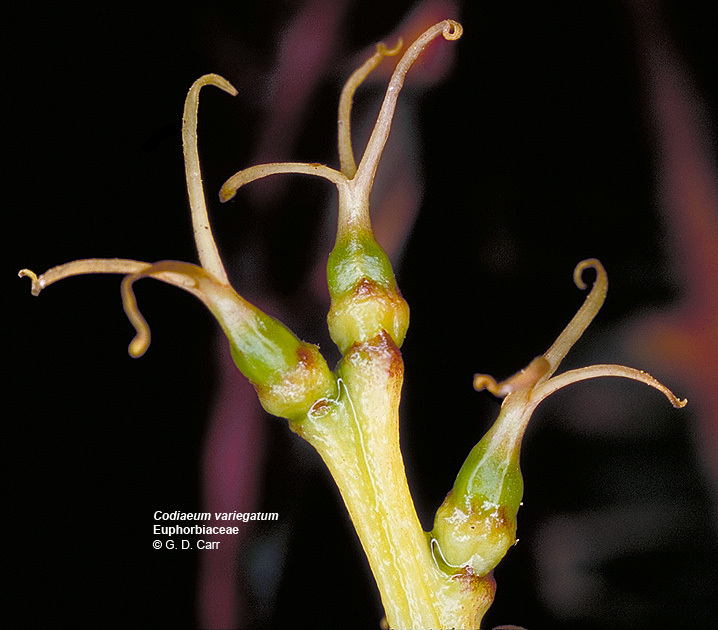 This is another example of the typical pseudanthium or cyathium found in the family. 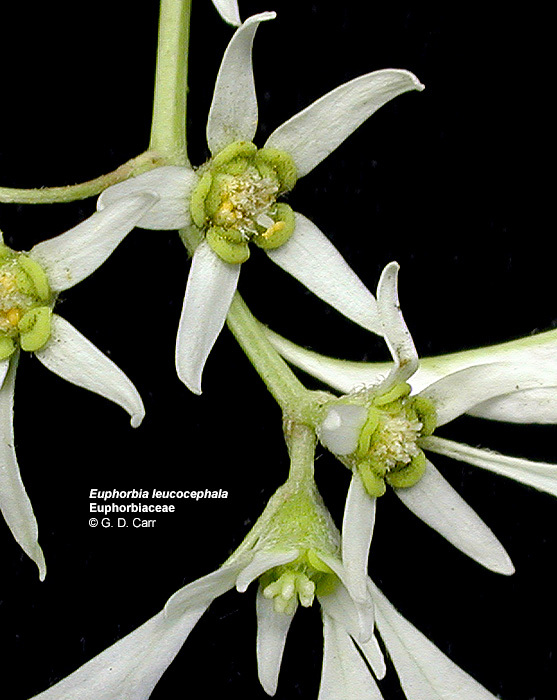 Note the petal-like peripheral appendages surrounding the unisexual flowers. It is characteristic for the single female flower in the center to become deflexed to one side as it matures. Note the 3 style branches. Hura crepitans, sandbox tree. 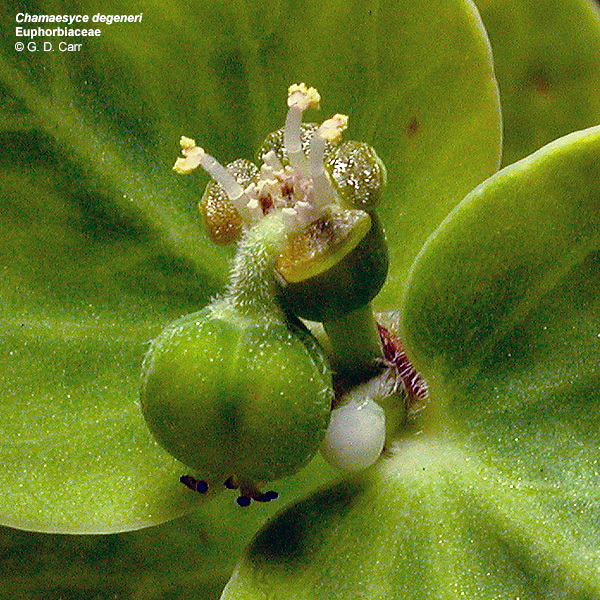 This unusual species has the female flower reduced to a naked pistil with a reddish peltate stigma as visible near the top left of the photo. A cone-like cluster of reddish male flowers is nearby. The fruit is also exceptional as it has many carpels that separate explosively into 1-seeded segments. Jatropha integerrima, rose-flowered jatropha. This is an example of an ordinary inflorescence of unisexual flowers. 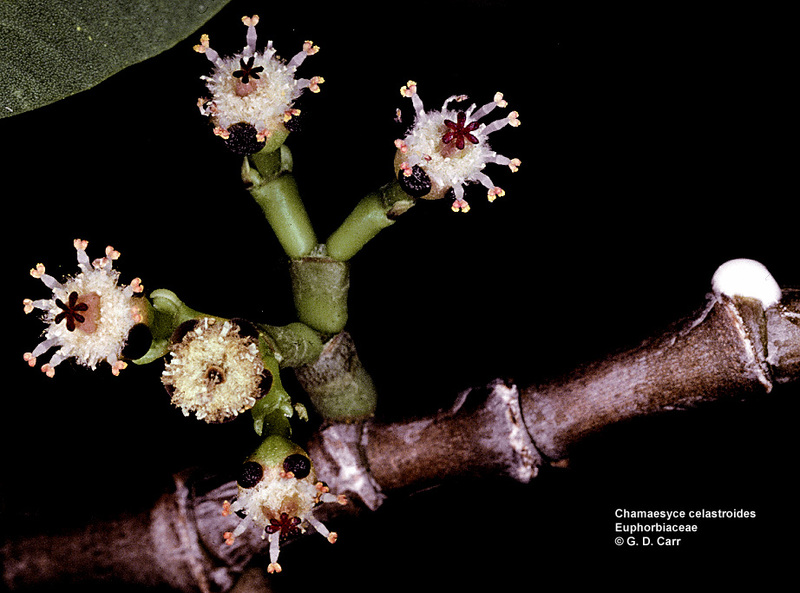 The male flowers have a monadelphous androecium of 10 stamens and the female flowers have a tricarpellate pistil and vestigial stamens. Both types of flowers have a biseriate perianth of sepals and petals. 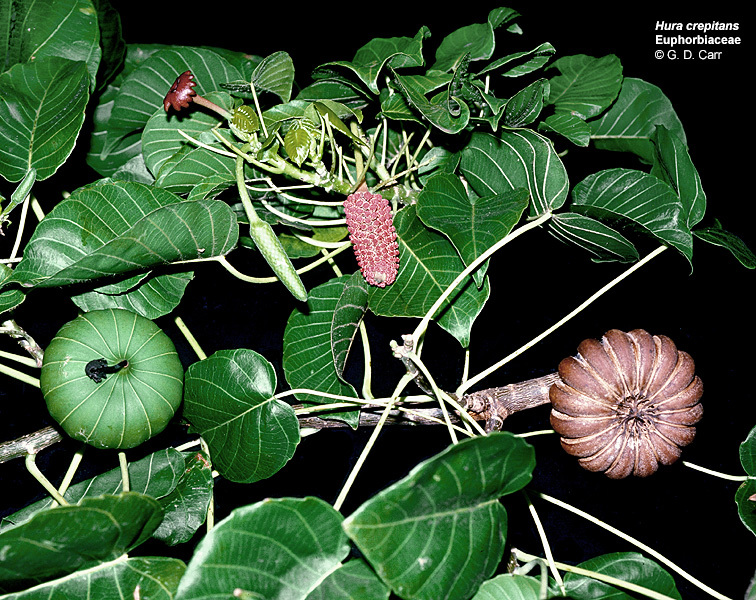 Manihot esculenta, tapioca, cassava, manioc. 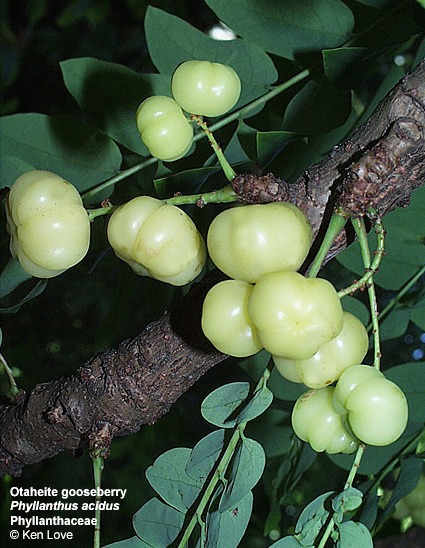 Shrub from Brazil, widely cultivated in the tropics for its large, tuberous roots that provide an excellent source of starch. Ricinus communis, castor bean. 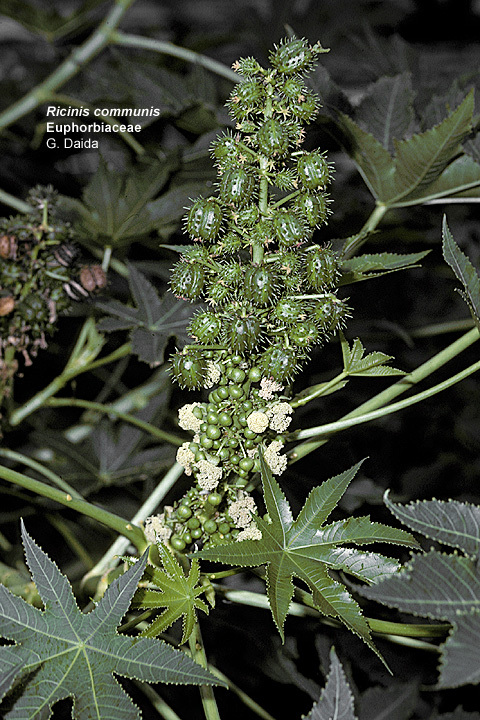 This very poisonous plant which provides castor oil is naturalized in Hawaii. 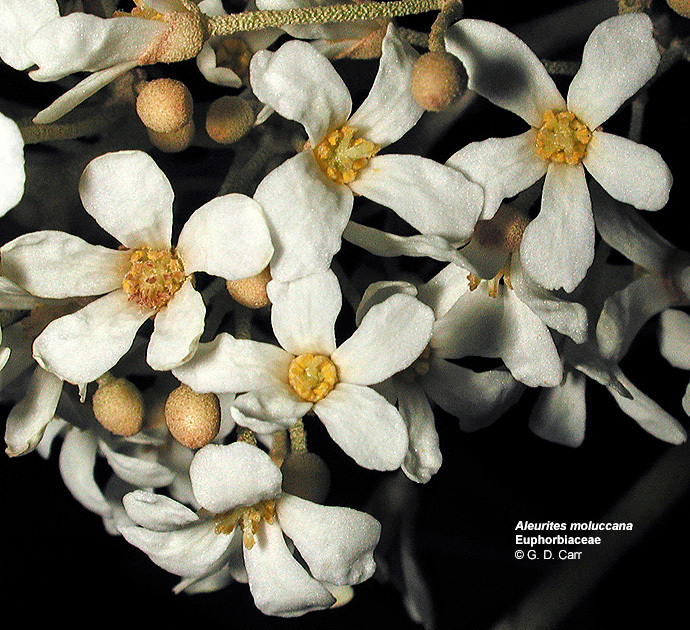 Notice the female flowers in the upper part of the inflorescence and the male flowers below. 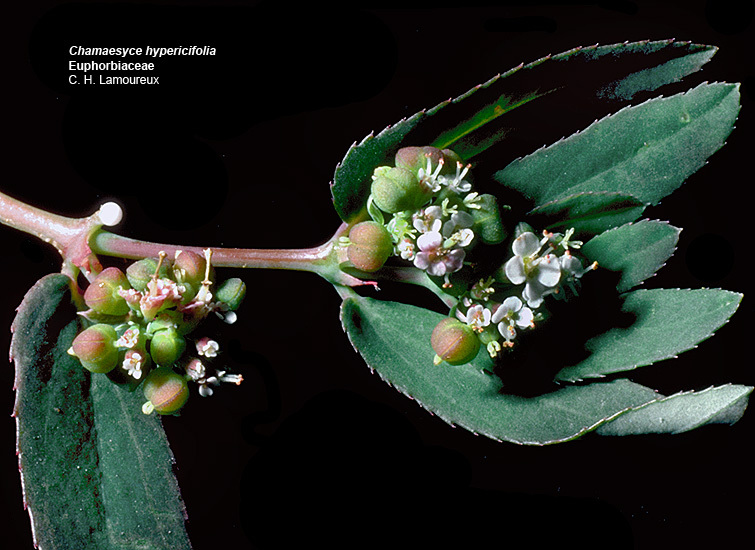 Petals are absent and the calyx is caducous. 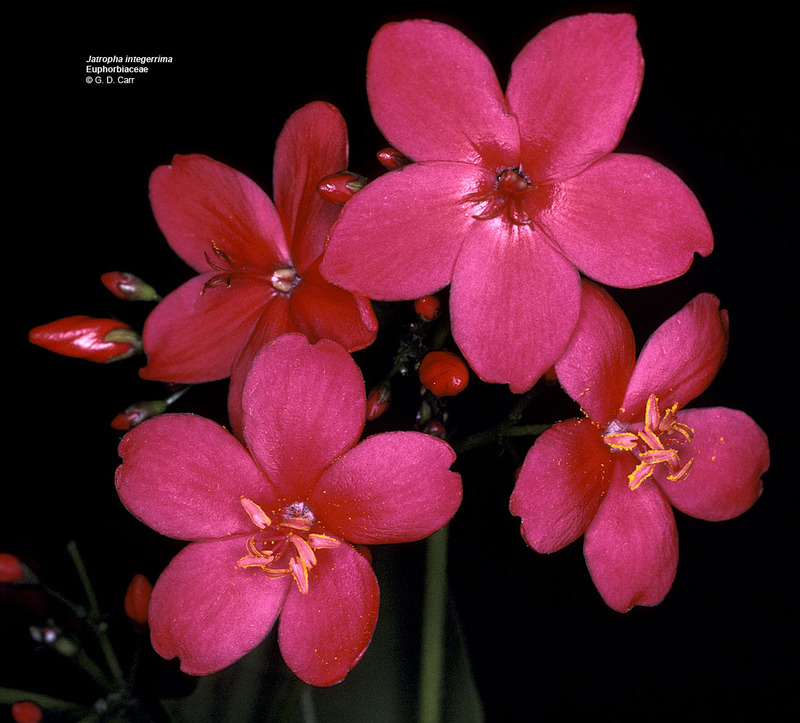 The tiny stamens are very numerous, up to 1,000 per staminate flower.